Where do we need to go, and how far have we come? This, perhaps, is the question a good, earnest reader would ask when diving into Rachel R. Martin’s Alison Bechdel: Conversations, a collection of interviews with the queer comics legend. However, I, an unstoppable fangirl, had a different question: is Alison Bechdel as cool and humble and intense as she seems?! 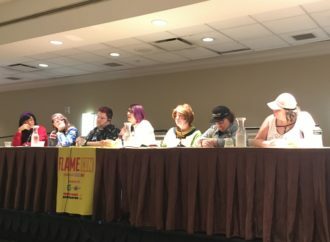 Dear queer readers, sometimes we can have it all. Martin’s book offers an academic take on Bechdel’s career and contribution to queer content in mainstream media, but also reveals several fascinating facts about her artistic process and personality. 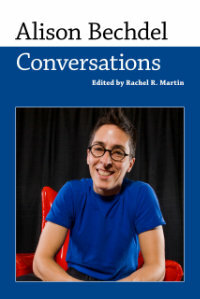 Alison Bechdel: Conversations is a slim book that contains an introduction by Martin, a timeline, and ten carefully chosen interviews that explore Bechdel’s influence on queer media. Martin has a theory about how Bechdel created space for herself in the mainstream, called the Bechdel Feedback Loop. Essentially, by embodying “the personal is political” and writing about her own life and the intimate lives of queer women, Bechdel pushes for cultural change. In turn, once that change occurs, Bechdel is able to write and create more, because in making more space for queer women, she makes more space for herself. 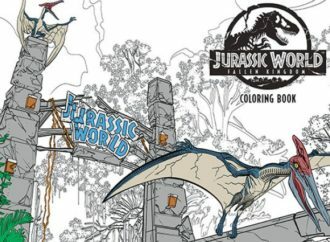 I struggled a bit with the introduction on my first read-through, largely because I was so excited to get to the interviews. Some readers may benefit from saving the introduction for the end, but keeping Martin’s concept of the Bechdel Feedback Loop in mind makes the rest of the book’s content more mind-blowing. 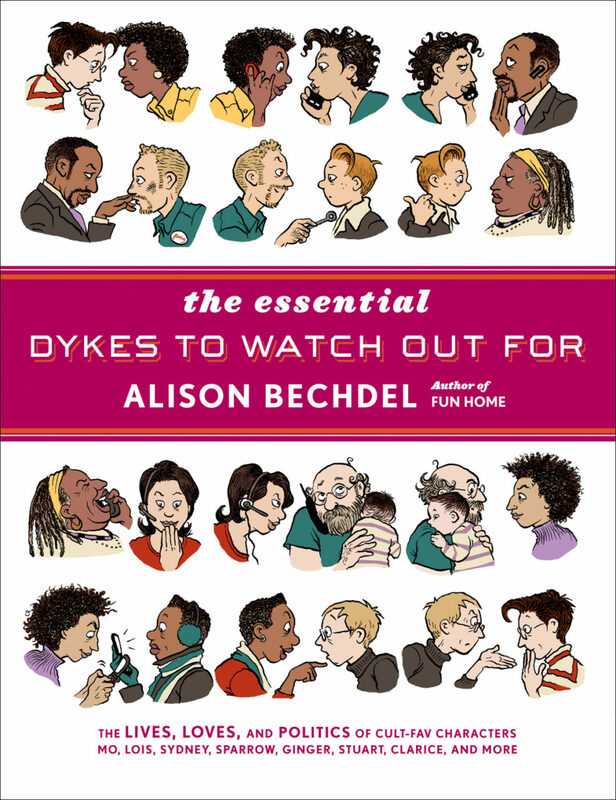 The interviews span from 1990 to 2017 and begin by examining how Bechdel grew the readership of Dykes to Watch Out For (DTWOF) and explored what it meant to tell a story that refused to put men at the center. After reaching a level of syndication unheard of for queer comic strips, Bechdel released Fun Home to critical acclaim, and did yet another unthinkable thing: she got more famous. 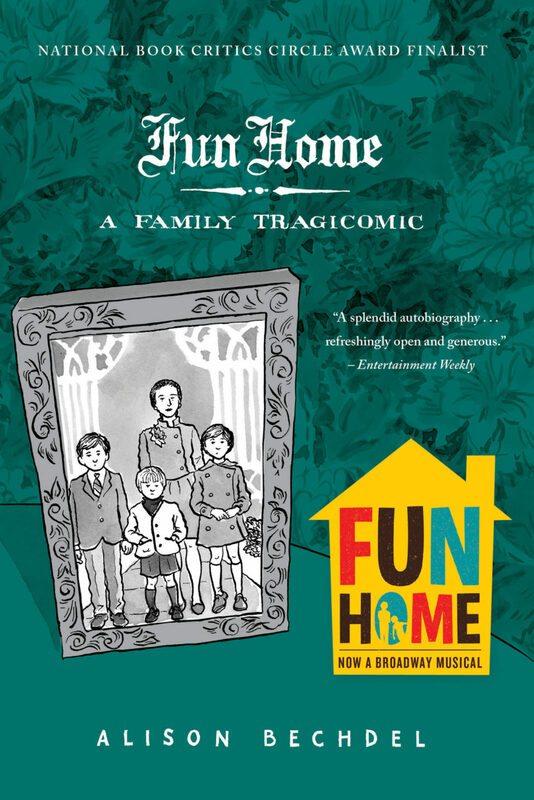 These carefully curated interviews discuss the Fun Home musical, her second memoir Are you My Mother? or her MacArthur Genius grant, slowly revealing how Bechdel’s work helped get relatable queer comics into libraries, bookstores, and even academic classrooms. Martin focused on acquiring interviews published in smaller presses or that were previously only available in video or audio formats. Choosing a series of interviews to pull together sounds like a simple act, but a book like this requires careful balance. Martin had to both capture important cultural shifts that accompanied Bechdel’s career and provide information that Bechdel’s fans will love. I learned so many fascinating and exciting tidbits about Bechdel’s writing and drawing processes that, at times, I felt like I was reading a page-turner. Some of these tidbits are just fun – like Bechdel’s love for Richard Scarry, which explains how she came to pack so much into a single panel – and others reveal the important contexts within which she created each work. 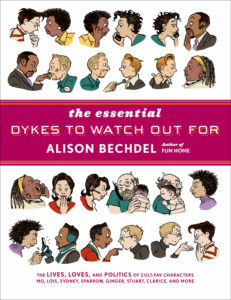 For example, I was incredibly excited to learn that when Bechdel was working on DTWOF, she subscribed to every queer magazine, zine and news source possible, so that she could speak to real issues affecting queer people. The thought that queer zines fueled DTWOF and, consequently, the beginning of Bechdel’s career, is mind-blowing, at least for me. Making a zine can feel like such a small act, but Bechdel’s use of queer zines shows that it can have an enormous impact. It’s equally incredible to watch Bechdel become successful without compromising her goals or her queer morals. In a 2000 interview in The Guardsman with Wesley Joost, Bechdel reveals that Universal Press Syndicate offered her a “mainstream” gay and lesbian strip, but she turned them down because she was unwilling to work within the limitations they required. At that point, Bechdel was entirely financially independent thanks to DTWOF. She also thought, because of that experience with Universal Press Syndicate, she would never achieve national syndication. She did more than the impossible. She created space within the mainstream for her own queer work, and for many others. Of course, no one creates work in a vacuum. Martin doesn’t discuss the contexts that allowed Bechdel to move into the mainstream as directly as I would’ve liked, but there are several moments in the interviews that address this. Bechdel’s timing was crucial – as mentioned above, she was writing at a time when other queer presses were also creating work that was pushing into the mainstream, even if they were making compromises to do so. 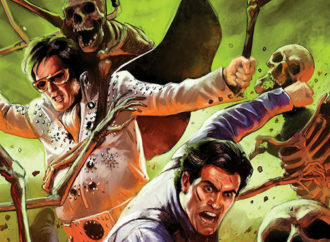 Several of the interviews also address changing mindsets regarding the medium of comics. In a 2007 interview with John Zuarino in Bookslut, Bechdel addresses a library in Missouri that wanted to ban Fun Home. Bechdel chalks this up to people not understanding that comics are evolving, and aren’t just for children. 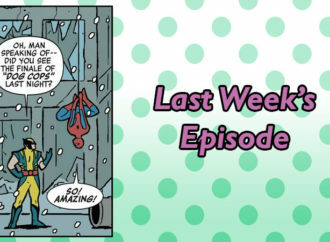 While such incidents still occur in the present day – comics for children and teens are among the most challenged in libraries and schools – in 2010, Bechdel’s interviewer turns out to have read DTWOF in an academic classroom. 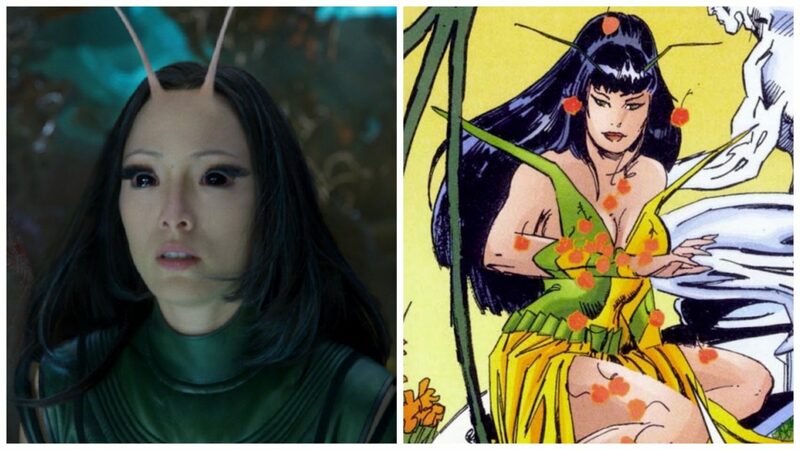 There is no perfect, smooth cultural shift from “banning and misunderstanding comics” to “appreciating and studying comics” because that just still hasn’t happened, but it is clear that the medium is receiving more respect, and Bechdel both contributes to and benefits from that. While I was working on this review, I was also writing my review of Cathy G. Johnson’s The Breakaways, a gorgeous middle grade comic about a group of subtly queer kids who stumble and fall into friendship via their school’s soccer team. Bechdel has always written for adults, but as a librarian who has always worked with youth, I am always interested in how youth literature is impacted by broader cultural movements. It was really stunning to read these books simultaneously and think about how work like Bechdel’s, despite being for adults, is part of a movement that creates space for work like Johnson’s. 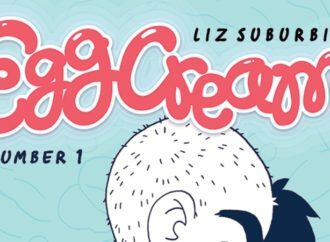 What all of these comics hope to do, of course, is to reach out to other queer people – queer adults, and queer kids, who need to see that others will accept them for who they are. My ultimate takeaway from Martin’s book is an image of Bechdel as a lesbian cartoonist who was open to learning from other queer and trans people, but who never compromised when straight culture wanted her to. Alison Bechdel: Conversations is an academic book that holds great appeal for fans of Bechdel’s work. 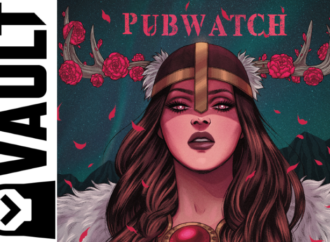 It’s accessible, exciting, and prompts a lot of fun questions about how much harder we need to push to get more queer comics into the mainstream. Snag your own copy from University Press of Mississippi.